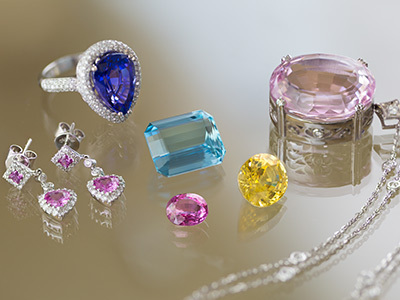 The essential value for most jewelry is what it is worth if you reduced it to its basic elements and considered the purity, quantity and rarity of those elements, notably the gemstones and precious metals. To put it another way, an ounce of 14-karat gold is worth an ounce of 14-karat gold. That essential value forms a starting place, which is built on by considering the remaining criteria. Diamonds are valued on the 4 C’s: clarity, cut, color and carat. Precious metals, like gold, are essentially valued by purity and weight. Some gemstones are considered to be more valuable than others. For example, high quality rubies, emeralds and sapphires (the Big Three) are more likely to command a higher price than say an amethyst. Again, the quality of these stones vary greatly so we take all factors into consideration when buying a piece. Sometimes we will offer to remove a stone and return it to the customer rather than offering them a small amount of money for it. The market is quite literally saturated with stones at this time, driving values down. Exceptional pieces are always held on their own merits, however, and will be treated as special. if a piece has been created that has exceptional style. Also, any certification of authenticity or other documentation (i.e. GIA Diamond certificate) can also help increase the jewelry value. Believe it or not, the original packaging on some pieces actually adds to the value, so if you are buying a special piece of jewelry it pays to take care of the wrappings as well. Obviously, any significant damage to a piece of jewelry can devalue it. However, all jewelry is expected to undergo wear and tear, especially antique and estate pieces. Antiques may actually become devalued depending on whether they have been repaired, restored or altered, and the quality of work that was done to it. It all depends on the piece, but it is a factor that can lend to a piece’s value.